See the interactive infographic below. Mandatory life without parole for a juvenile precludes consideration of his chronological age and its hallmark features—among them, immaturity, impetuosity, and failure to appreciate risks and consequences. It prevents taking into account the family and home environment that surrounds him—and from which he cannot usually extricate himself—no matter how brutal or dysfunctional. After that ruling, there was a lot of debate about whether it applied to those inmates who had already been sentenced this way. It was a big deal, especially in those states that sentenced a lot of teens under 18 to life in prison without the possibility of parole. Michigan is second only to Pennsylvania in the number of so-called “juvenile lifers” in its prisons. Life without the possibility of parole was a sentence handed down to a lot of teens convicted of terrible crimes – especially after Michigan Gov. Engler adopted his “punks prison” policy in the mid-90s. 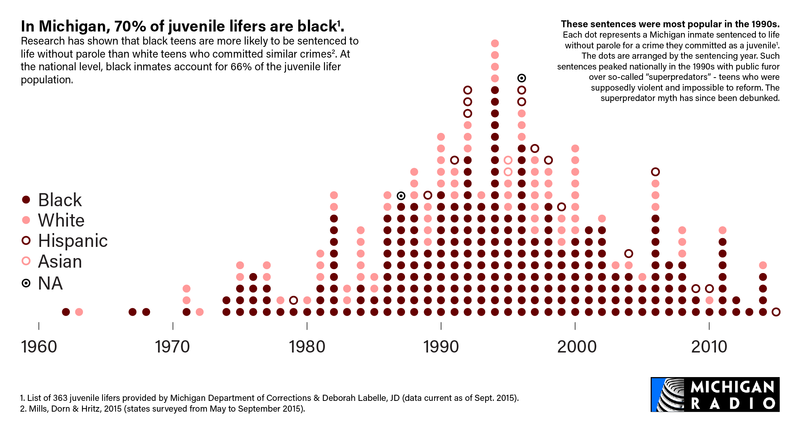 Graph shows when teens were sentenced to life in prison without the possibility of parole in Michigan. Studies have shown that this sentence disproportionately fell on blacks. After the 2012 U.S. Supreme Court ruling, Michigan was among those states that fought to keep the ruling from applying to those already in prison. There were bills drafted to keep the ruling from applying to those already sentenced this way. And Michigan Attorney General Bill Schuette was one of those leading the charge against keeping the ruling from applying retroactively. In January of 2016, the U.S. Supreme Court settled that argument too. In Montgomery v. Louisiana, the court ruled its earlier decision did apply retroactively. This has meant that the more than 360 so-called juvenile lifers in Michigan -- the second-highest total in the nation -- are eligible for re-sentencing, and possibly a second chance. Since that ruling, Michigan has been criticized for being slow to respond. Of the approximately 363 juvenile lifers in the state, prosecutors are seeking life without parole again for 229, more than 60%. Prosecutors in many Michigan counties decided that not a single juvenile lifer convicted in their courts deserved even a chance at parole. Michigan Radio looked at the state's juvenile lifers in a special series. See the entire series here.